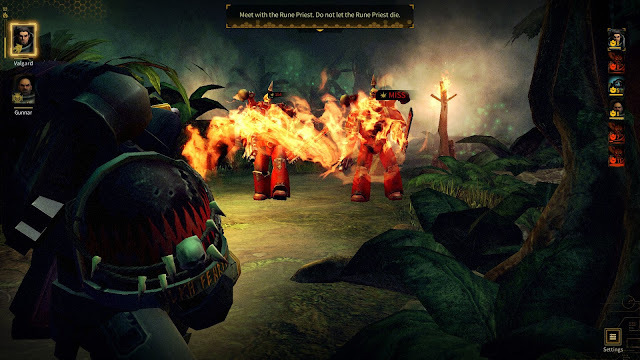 Once upon a time there were only a couple of Warhammer 40k games for PC, and there was much lamenting this fact, until one day the winds changed, and 40k games of various quality began springing up like Orks. Some of these new games were decent enough, while others were a bit of a mess. One thing is for certain, developers were forced to pair the theme of 40k with all sorts of interesting mechanics, simply to stand apart from the crowd. 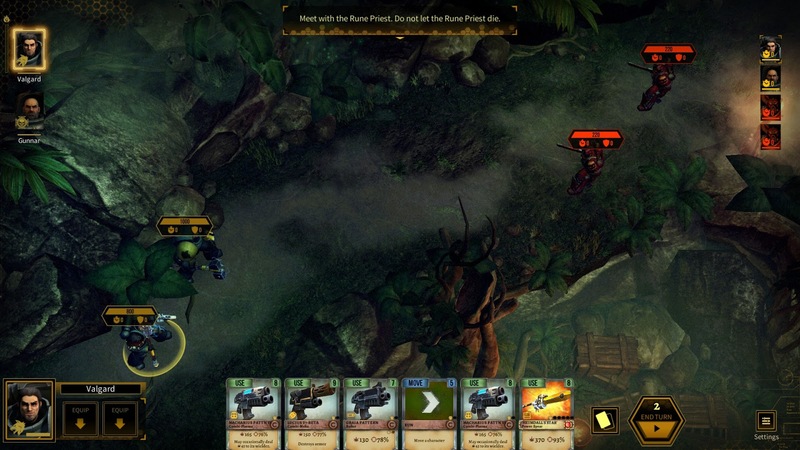 Into this crowded field of combatants steps Warhammer 40k: Space Wolf, a game which pairs the turn based tactical combat of XCOM with the deck building mechanics of Hearthstone. 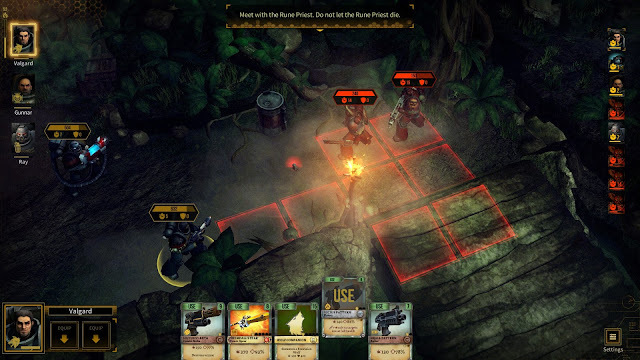 Individual Space Marines travel about on a grid facing off against Chaos Marines and other heretics. Your Marines each have a deck of cards which are drawn from to form your "hand" of options. The cards can be played to attack, move, or activate some other ability. Once you play a card it's gone, so you have to balance what you need now with what you may want to do in the future. While this may seem odd to some, this card driven combat actually works quite well, and is even addicting. Completing scenarios and optional objectives will unlock more cards for you to use in your decks. There is also a light RPG system of leveling up the characters in your squad, allowing you to unlock various perks for each one. The cards represent all the different weapons you would expect to find on a 40k battlefield. Bolters of all types, melta guns, flamers, explosives, and various combination weapons. There are also the ever grisly melee weapons like chainswords, axes, power fists, spears, and more. For any given weapon, there are a variety of different cards which represent it, some with better stats and even extra abilities, like letting you draw another card when they are played. One important stat on every card is the "effort" value, which ties into the initiative system. Basically, using cards will increase your effort level for that character, then over time that number will decrease, and this constantly shifting value determines the dynamic turn order. Using the really cool and powerful cards will increase the number faster, which means an enemy using lighter attacks may get to go twice before you character acts again. Balancing this number is a critical part of the gameplay, as enemy units often out number yours considerably, and edging them out in turn order can be the difference between victory and annihilation. Some cards can also let you (and the forces of Chaos) pull off combo moves that will give some kind of bonus. These often have a requirement such as attacking an enemy from a specific range, or using a melee weapon, before they activate. Firing off these combos will help you be more efficient, which is important because the enemy squads will keep coming at you with no mercy during most missions. Another type of card is one that can be "equipped" on your character. These often give you an overwatch ability that can fire during the enemy's turn. Unlike most cards, these equipped cards stay around and can be "reloaded" by sacrificing certain other cards from your hand. Each scenario gives you some sort of task, such as reaching a certain point on the map and defeating an enemy, saving a comrade, or simply holding out against waves of attackers. There are also optional objectives you can try to complete to earn bonuses. I was surprised to find myself playing the same mission several times over, trying to get the optimal outcome. The scenarios typically have your Marines facing a ton of enemies that spawn in at the most inopportune moments. This creates a challenge certainly, but can sometimes feel cheap, since you really have no idea when or where they will arrive. You may survive the fight the first time around, but will likely be unable to complete the bonus objectives until playing through again with a bit of foreknowledge about where and when attacks will come. To get the most out of your squad for a particular scenario, you may need to go back to the barracks and tweak your team. This includes changing up the cards in your deck, and switching out different perks for each squad member. You can invest a limited number of points in unlocking more perks for a given marine, or your primary character. You can also choose to send your main man into battle with a different armored suit. Scout, tactical (the standard), and terminator options are available. Each comes with advantages and disadvantages, and unique options in terms of cards, which will change up your strategy quite a bit. The scout armor, for example, has lighter defenses, but can move quickly and use sniper rifles. Burning more than one enemy with the flamer is always satisfying. Outside of missions, you can also spend resources to craft new cards and try to get better versions of each one. Much like other collectible card games, there's a drive to collect all of the "legendary" cards that will really beef up your deck. I've only tinkered with that area of things, so I'll save more details for my review in the future. Likewise, the game does have multiplayer, but I have not dipped my toe in that pool of chaos just yet. I'll talk a bit about the graphics and sound for a moment. While the visuals are not going to blow anyone away, as this was originally a mobile game, they serve their purpose well enough. The animations are nicely done in particular, with especially meaty melee attacks that send blood flying. The sound effects are pleasing as well, better than I expected going in. I really enjoyed the music that I have heard so far. It's quite a moody and matches the grim dark tone. You might have noticed that I mentioned this was originally a mobile game. Don't start backing away! The developers are well aware of the stigma that many such cross-platform games face, and they are deliberately setting out to make this version of the game take full advantage of being on PC. Obviously, the fact that they are taking their time developing the game for the next several months, instead of just shoving a port onto Windows and calling it good, speaks volumes on its own. They are accepting feedback from players, and want to make this the best version of the game out there. 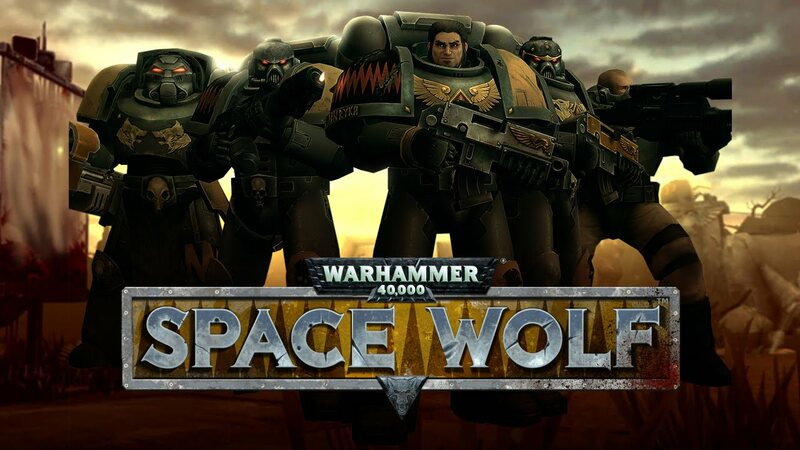 While this game is still in very early access (I think I started at version 0.0.2 and it's now at 0.0.6), there is certainly enough solid gameplay here for anyone looking for some more WH 40k gaming. 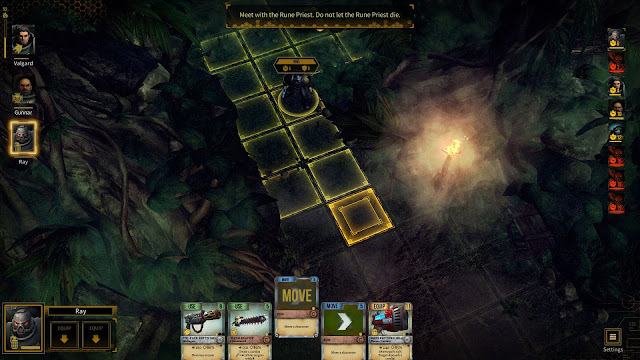 The combination of card driven actions and tactical turn based movement works better than anyone might expect. The game only costs $12 at the moment, so if you are at all interested you won't be risking much by giving it a shot. If you have your doubts, just keep an eye on the steady stream of updates coming from the developers. This week they made some big changes with weapon balancing, which I was playing with right before this review. This update alone increased my enjoyment of the gameplay quite a bit, since it made melee weapons a lot easier to engage with. I look forward to seeing how this game shapes up over the course of the year. The planned release date is sometime in Q4 of 2017.